S E Jorgensen, Copenhagen University, Copenhagen, Denmark © 2009 Elsevier B.V. All rights reserved. Rachel Carson's book A Silent Spring started in the mid 1960s the first green wave. Pollution problems were able to attract the political attention in line with other impor tant problems such as social problems, traffic problems, economic problems, and educational problems that the society would have to deal with and solve. The pollution problems, often called the environmental problems, could be solved at that time only by use of one tool box: environmental engineering. The tool box contained a wide spectrum of cleaning processes such as settling tanks, filters, scrubbers, aerators, trickling filters, and bio gas reactors - all man made components. Figure 1 illustrates the idea behind the use of the environmental engineering tool box. The pollution problems were a result of our activities - particularly industrialization and urbanization. The problem was that nature could no longer absorb the increasing pollution due to the growing production, population, and urbanization. The obvious solution of the problem was therefore to use a technology that could remove the polluting components from all types of waste before discharge to the environment. The environmental engineering tool box was, how ever, expensive to use and insufficient to resolve all environmental problems. Therefore, three additional tool boxes were developed during the 1970s and the early 1980s: environmental legislation, ecological engi neering, and cleaner technology. Environmental legislation prevents pollution by use of legislation. All uses of DDT for instance were banned in 1970 in North America and Europe. It was an effective and very cost moderate method to solve the pollution problems associated with the use of DDT. It is, however, far from possible to solve all environ mental problems by use of environmental legislation. The society needs for instance agriculture, food production, transportation, and so on. A few toxic chemi cals can easily be banned, but it is of course not possible to ban the production of healthy food items. Environmental legislation is therefore a tool box with effective tools and solutions but the number of problems that can be solved are limited and are very specific, too. It is obvious from Figure 1 that it would also be possible to solve the environmental problems if we could change our production in a direction that would involve less pollution. It is named cleaner technology or alternative technology and has developed rapidly since the early 1980s. There are numerous examples of minor and major changes in the production, in the construction of buildings and roads, and in our urban planning that all have reduced the pollution significantly. A very evident example is the use of a new technology based on recycling of waste components, whereby the amount of waste and the use of raw materials are reduced simultaneously. • How can we help the ecosystems to cope better with the pollution and enhance their ability to decompose and absorb pollutants? • As ecosystems are able to absorb pollution and reduce pollution problems, would it be possible to solve the environmental problems by installation of a man made ecosystem before the natural ecosystem? • Could a better planning of our use of nature based on ecology solve some of the environmental problems? • Could a proper use of nature's ecosystems solve or at least reduce the environmental problems? Environmental planning included in Figure 1 presumes an ecologically acceptable planning, which implies that often it has to draw on the ecological engineering meth ods presented in the part Application of Ecological Principles in Environmental Management. Figure 1 The environmental problems are a result of urbanization and industrialization. To abate the pollution problems, we can use four tool boxes. Ecological engineering (also called ecotechnology) can be used to reduce the impact of both industrialization and urbanization by a wide spectrum of treatment methods. Ecotechnology can also be applied to recover ecosystems and make them able to cope better with the problems. Environmental technology can be used for direct reduction of the pollution problems resulting from both urbanization and industrialization. Environmental legislation can be used to solve, in principle, all the problems. Cleaner technology attempts to change the production methods of particularly the industries to reduce the waste loadings. Environmental planning is able to reduce the impact of urbanization at an early (planning) stage. 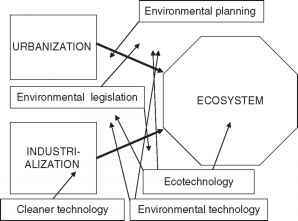 It requires inclusion of ecological considerations and may therefore to a high extent draw upon the ecological engineering methods, presented in the part Application of Ecological Principles in Environmental Management. that offer sustainable solutions to many environmental problems, often in combination with tools from the other three tool boxes. There is therefore a need for a good overview of the available ecological engineering methods. This book presents an up to date overview of ecological engineering methods with information about how the methods are working, how they can be used to solve the pollution problems, and which environmental problems they can solve solely or in combination with the other three tool boxes. Before the available methods are presented one by one, it is necessary to give the definition and classification of ecological engineering methods. The next chapter pre sents a basic overview of the field, which includes a discussion of relevant subdisciplines and related fields. The most frequently applied classification of ecological engineering - four classes are applied - is also presented in this chapter. The classification will be used throughout the book. As all engineering fields, ecological engineering requires quantification of the problems and the engineer ing design. Ecological modeling is a powerful tool to quantify and synthesize our ecological knowledge, and therefore ecological modeling and ecological engineering are working closely together. It would, however, be too comprehensive to present ecological modeling in suffi cient details in this book to be able to illustrate its use properly in an ecological engineering context. Those interested in modeling are referred to the book by S. E. J0rgensen and G. Bendoricchio. The chapter Design Principles discusses the princi ples used in ecological engineering design, but does not discuss the ecology behind the design principles. The fundamentals of the ecological engineering methods will, however, be uncovered in the chapter Basic Ecological Principles as Basis for Ecological Engineering. Quantification of an environmental pro blem does in most cases require the development of an ecological model, but it is also possible to use or supplement the use of models by environmental impact assessment (EIA), which is presented in the chapters Environmental Impact Assessment and Application -Part 1 and Environmental Impact Assessment and Application - Part 2. EIA is included in this book about ecological engineering because it is a tool to minimize the impact of human activities on the envir onment and is based on information about the effects on the ecosystems. All engineering disciplines are rooted in basic sciences, and the basic science of ecological engineer ing is, not surprisingly, ecology. W. Mitsch and S. E. J0rgensen have presented and discussed 19 eco logical principles that the ecological methods have to follow or have to be based on. The principles are not only used in the design and management of ecological methods but also to understand the basic ecology that is behind each of the applied ecological engineering methods. This book refers to the 19 principles in an effort to answer the following questions: Are the eco logical engineering methods applied today sustainable and ecologically sound? Are the methods rooted in sound and basic ecological principles? These questions will be answered for each of the methods in the chapter Basic Ecological Principles as Basis for Ecological Engineering, while the details of the methods are presented in the parts Use of Natural and Semi natural Ecosystems to Solve Environmental Problems, Restoration of Ecosystems, Constructed Ecosystem - Imitation of Nature, and Application of Ecological Principles in Environmental Management -four parts corresponding to the above mentioned four classes (see also Ecological Engineering: Overview for the definition of the four classes) of ecological engineering. See also: Basic Ecological Principles as Basis for Ecological Engineering; Ecological Engineering: Overview; Design Principles; Environmental Impact Assessment and Application - Part 1; Environmental Impact Assessment and Application - Part 2. J0rgensen SE (2009) Introduction to Ecological Modelling. 205pp. Modelling. 525pp. Amsterdam: Elsevier. 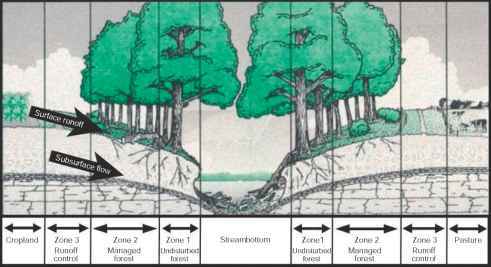 Mitsch W and J0rgensen SE (2003) Ecological Engineering and Ecosystem Restoration. 386pp. New York: John Wiley.